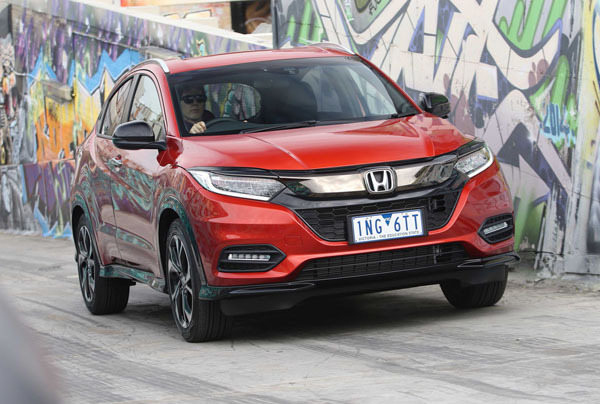 Following our recent two-week outback holiday in Queensland driving a Honda CR-V we moved across into the HR-V’s smaller brother, the Honda HR-V. In particular a newly introduced model, the RS which is a semi sporty variant. The introduction of the RS brings the 2018 HR-V range to four model grades: VTi, VTi-S, RS and VTi-LX. The HR-V RS has 18-inch alloy wheels, black chromed main grille, honeycomb lower grille and foglight garnish. Keeping up the dark theme it has black door mirrors; dark chromed door handles; and a piano black body kit. Inside, are heated leather-trimmed seats, a leather-wrapped sports steering wheel and gear knob and alloy sports pedals. The above details are of the new HR-V RS, however Honda has taken the opportunity to facelift the rest of the HR-V range. We are told that these are based on the oft-lauded styling of the Honda Civic. The updates include a new front bumper and grille across the range and LED headlights from the VTi-S upwards. 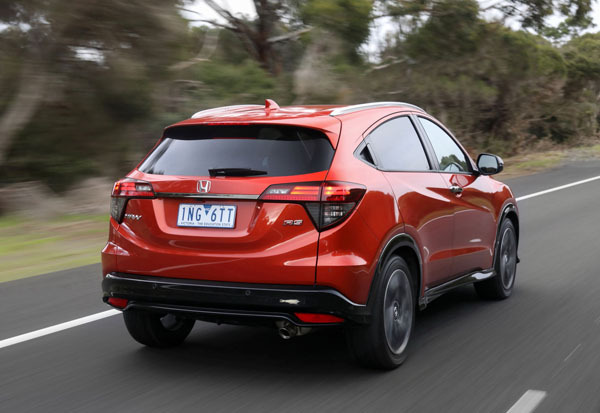 Though it’s aimed at the sportier side of the SUV market, new HR-V RS doesn’t have any more performance as it retains the standard 1.8-litre, four-cylinder engine that continues to produce 105 kilowatts of power, with torque of 172 Newton metres. All HR-V models have a CVT automatic, but in this latest upgrade of the range it features stepped ratios at full throttle. This gives a sporty feel without taking too much away from the added efficiency of a CVT. There are paddle shifters on the RS if the driver doesn’t agree on the ratio chosen by the computer. 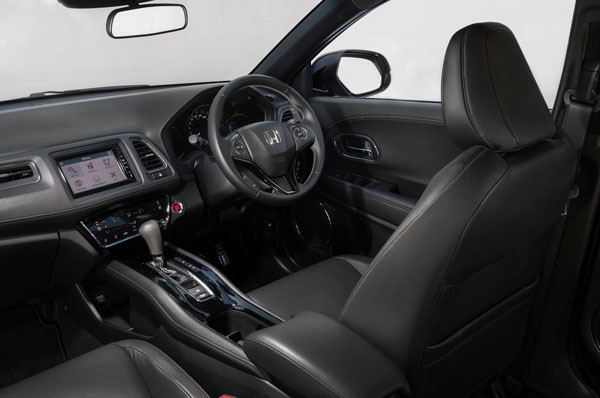 The HR-V offers advanced audio, information and connectivity features via a 7.0-inch touch screen. There’s Bluetooth connectivity for Apple and Android systems, including audio streaming, Siri with Apple iPhone and HDMI audio. As well as the normal suite of passive and active safety systems, the RS has Forward Collision Warning and Lane Departure Warning. The latter determines if the vehicle is unintentionally leaving the lane and gives visible and audible warnings to tell the driver to concentrate on driving. Stepping out of the Honda CR-V into the smaller HR-V was interesting. There is less loss of interior space than we had expected. Certainly it’s smaller, but two adults can be carried comfortably in the back without too much compromising between front and rear occupants. The RS’s luggage area isn’t a lot smaller either and, of course, uses Honda’s excellent fully flat ‘magic’ system that’s spacious and easy to use. New-design front seats are fitted to the RS. These gave good support and comfort during our test period. Honda tells us additional insulation for a quieter cabin in RS and the interior ambience felt like that of a larger, more upmarket SUV. Incidentally, the topline HR-V model, the VTi-LX, also receives the same seats and extra insulation as the new RS. Much of the work to produce the semi sporty RS is in the suspension and handling department with firmer damper and spring rates for reduced body roll. In an interesting move the RS has a new variable steering gear ratio of 2.38:1 compared to the 2.79:1 of the other in the HR-V range. You wouldn’t exactly call this a track day car, but there was plenty of driving pleasure from the way the RS felt when we took it over our hilly test route behind our home on the Gold Coast. It’s quick to respond to steering inputs, isn’t fazed by sudden changes of direction and throttle control in bends works nicely. Comfort hasn’t suffered overmuch, though some passengers did say it bumped around more than they liked on some of the harsher road segments. Tyre noise is generally pretty good though good-old Aussie coarse-chip surfaces do increase it, particularly on newer surfaced segments. You don’t get something for nothing in this world and as keen drivers we are more than happy with the way this Honda feels. As always do your own pre-purchase test drive and make sure you cover the sort of roads that you will be following in day-to-day driving. And perhaps take it for a fang on your favourite Sunday-drive roads. Honda’s new RS variant of the popular HR-V is enjoyable to drive and a competent load carrier. It would certainly get a place on our short list if we are contemplating a small-medium SUV.